​The Risk Number is a proprietary scaled index developed by Riskalyze to reflect a “risk score” for both an investor’s unique Risk Fingerprint, or for a specific portfolio of investments. As you can see, it’s shaped like a speed limit sign, so a higher Risk Number means a higher level of risk and potential return. An investor’s Risk Fingerprint is a multi-dimensional variable reflecting the complexity of an individual investor’s risk tolerance. On the other hand, the Risk Number is a single-dimension variable designed to approximate the relative risk between people or portfolios. Thus, a “45” portfolio generally has more risk than a “44,” but two “45” portfolios may be quite different from each other. One of the most important drivers of the Risk Number is the measurement of downside risk: either the downside risk in the investor’s comfort zone (the range of risk to reward that they approve via risk questionnaire or Risk Target), or the downside risk in a portfolio as measured by the 95% probability range. In every Riskalyze portfolio, we calculate a Six Month Probability Range. Each portfolio has a 95% mathematical probability of ending up within that range, six months from today. We cannot predict where a portfolio might end up inside of the range, and there is a 5% probability it will end up outside of the range. ​The underlying data model for calculating the six month probability range is an important factor in this equation. Our technology is model-agnostic, but we needed to develop a solid and stable one. The results speak for themselves — for the $2 billion in portfolios built on this data model in 2012, the platform was far above 95%. Less than 1.6% of portfolios broke below projected risk, despite the serious volatility in May 2012, or the high number of AAPL-heavy portfolios that dropped in value in the fall of 2012. ​In 2014, Riskalyze added several key improvements to the model, such as correlating bond market risk to the 10 Year US Treasury rate, and improving how they calculated the risk of tactically-managed funds designed to make money in up and down markets. We identify each investment in a portfolio as either standard, tactical or interest rate sensitive. Riskalyze filters each investment into one of four return mode categories (Standard, Tactical, Interest Rate Sensitive or Average Annual Return). For standard investments, we use actual volatility and correlation data from Jan 1, 2008 to present. If an investment has less history than that, we use extrapolation methodology. Standard investments are identified by our methodology as being traditional or passive in nature. Individual stocks or equity focused ETFs, mutual funds, annuity sub-accounts are often included under this label. For tactical investments, we use upside downside capture ratios, volatility and correlation data from Jan 1, 2008 to present. Our upside downside capture ratio calculations are taken over 4 distinct market environments. Our analysis confirms that calculating capture ratios over short frequencies (think daily, weekly or monthly data points) is not as robust as calculating capture ratios throughout or during various market trends. Calculating capture ratios through different market trends is objective and gives tactical managers multiple opportunities to have their strategies prove themselves. So, instead of having one upside downside capture ratio based on Jan 1 2008 - present capture statistics, our methodology takes into account the upside downside capture ratios over 4 different market periods. ​​For newer tactical strategies the capture ratio will be affected to the extent that a tactical strategy did not participate in any of the four market environments. For example, a strategy with a 2012 start date will not include data that allows for downside capture calculations since the strategy has yet to experience a bear market environment, thus downside capture will be correlated to upside capture until which time as the strategy navigates a bear market. For interest rate sensitive investments, we use correlation to the 10 Year US Treasury rate to model bonds and other interest rate-dependent securities, and we use actual volatility and correlation data from Jan 1, 2008 to present. If an investment has less history than that, we limit the amount of anti-correlation the investment can provide to the overall portfolio, to err on the side of safety. Interest rate sensitive investments (Bonds) are identified by our methodology as having a high correlation with changes to the 10 year US government bond yield. We use correlation to the 10 Year US Treasury yield to identify interest rate sensitive securities. This allows advisors a mechanism for incorporating their beliefs, biases or stress tests on interest rate sensitive investments (typically bond ETFs/mutual funds) via updating the data model assumptions. Advisors simply input the direction (+/-) and magnitude of changes to the 10 year US Gov bond yield and our technology models the portfolio accordingly. Our methodology will not apply interest rate data model changes (stress tests) indiscriminately to all 'bond' investments; only those that have a history of being highly correlated to the 10 year US Gov bond yield. For example, some tactical, foreign, floating rate, etc. bonds will not be arbitrarily tied to interest rate assumptions. The Average Annual Return return mode will use actual historical average annual return of the investment and apply that as the expected return. Note that the Average Annual Return mode negates the data model assumptions (i.e. S&P/10-year US Treasury assumptions) completely; changes to those assumptions will not have any affect on investments set to use the Average Annual Return return mode. When calculating Average Annual Return, Riskalyze uses all of the historical data available. The calculated AAR will be calculated using actual price history from June 2004-present in cases where the investment existing in June of 2004. For newer investments the AAR will be calculated using inception to present price history. Data for Separately Managed Accounts and variable annuity subaccounts will be from their inception in most cases. We calculate the annualized number with the standard approach where (total point-to-point return) x (1/number of years) = average annual return. ​This return mode is best suited for investments that have unique (typically active) objectives where traditional beta adjustments or capture ratios understate the investment's realized risk/return characteristics. On a portfolio level (toggling each underlying investment to Average Annual Return), this functionality would allow an advisor to disregard the data model inputs altogether. For example, an advisor who wants to view a portfolio through a static historical lens can toggle each investment in their portfolio to use the Average Annual Return mode. However, advisors wishing to use the dynamic functionality provided by entering market outlooks in the data model will continue to be best served by using the Standard, Tactical or Interest Rate Sensitive return modes. Note: Some investments will have more historical price history than others based on their inception date. So, an equity investment with an inception of March 2009 will likely have a higher calculated average annual return than, say, an investment with an inception in January 2014. This calculation methodology is based on a return scenario for the S&P 500 and the direction/change in the 10 Year Treasury Rate over the next 6 months. As we do not want to predict what the return scenario will look like in the near term, the default scenario is called "Long Term Consensus." That scenario is designed for advisors who want to use the bedrock assumption of financial advice — that the long term of the future will be something like the long term of the past. The Long Term Consensus for the S&P 500 is +10.4% annually (including dividends) so we normalize it to 6 months by dividing by 2. We believe that there is no long term consensus on the direction or magnitude of change on the 10 Year Treasury yield so our default is set to "flat." Our default data model uses a 6 month return for the Standard and Poor's 500 of 5.2% (half of the long term historical average) and a "flat" interest rate environment. You can easily choose from another pre-set scenario, or enter your own S&P 500 and 10 Year Treasury Rate scenario, to recalculate the risk in the portfolio. 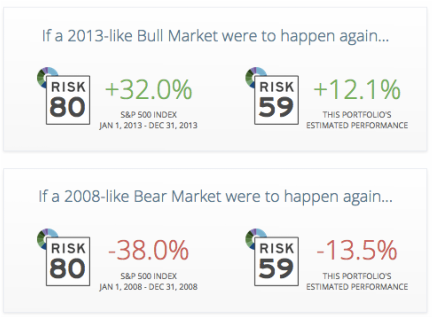 Riskalyze is often asked, " Why did you choose Jan 1, 2008 to Present for volatility and correlation data?" Our backtesting and real world testing has proven to us that weighting recent volatility and correlation data is more robust than the alternatives. Interestingly, this data model even managed to nail one important individual stock. We think nailing an individual stock should be rare in any data model, but if you built a 100% AAPL portfolio in August 2012, the Six Month Probability Range would have been –37% to +51%. And as we all know, AAPL dropped 36% over the following six months. No data model or portfolio analytics can quantify 100% of the risk. But we’re confident that our Six Month Probability Range can empower investors. Get My Risk Number Now!